Many shoulder patients are bombarded with a multitude of exercises to correct shoulder impingement. These can be difficult to perform correctly and regularly. We have extracted the top 5 home-based exercises from our in-depth shoulder impingement research, which are fairly easy to perform and easy to remember. While these 5 exercises are helpful, they are not the absolute gold standard and we explain further below. If you’d like to experience the latest innovative treatment, independently validated and designed to be the best, why not book a free 30 minute session at a time of your choice before scrolling down? Please ensure that you perform adequate warm up and stretches before you attempt any of these exercises. Performing any exercise without adequate warm up can result in injury. The following exercises are suited for those who suffer from shoulder impingement where the underlying cause is a change in muscle activation patterns. We do not recommend these general exercises if you have been diagnosed with a rotator cuff tear. The first two exercises revolve around correcting the kinematics of the scapula, stabilising it and strengthening the scapulothoracic muscles. Lin et al  showed that activating the lower trapezius and serratus anterior to help stabilise the scapula can reduce shoulder impingement symptoms. Similarly, Kamkar et al  also showed that strengthening the scapulothoracic muscles should be part of any exercise program. This is a simple exercise and is best described as countering hunched shoulders. You want to raise your shoulders, roll them back, down and then hold. In this position, you will be squeezing your scapula together. The purpose of this exercise motion is to engage your scapula stabilisers. 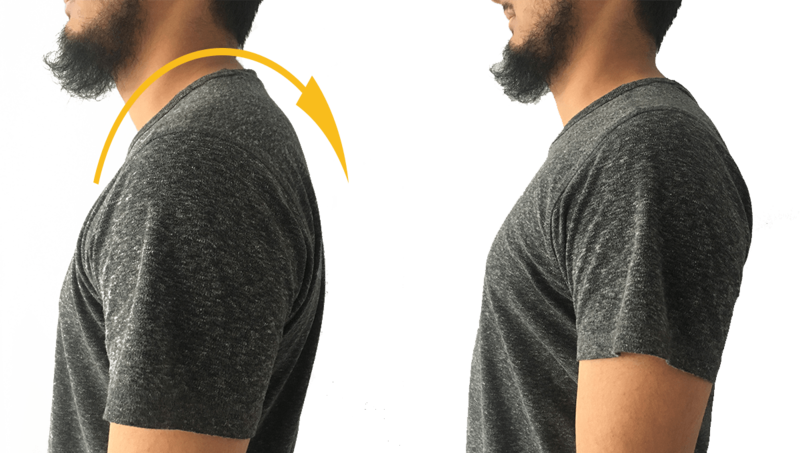 It is important that your scapula is in the correct position during your everyday arm movements and this exercise motion is aimed at helping do just that. You should aim to hold this position for 5-10 seconds. It is important not to arch your back, or cheat by using larger body movements. You should focus on moving your shoulders and not your spine. First, start with a scapula pull. There are many variations of this exercise and some call it different names. During this exercise you need your arms stretched out in front horizontally. Reach forward by moving your shoulders forward only. Do not move your back or neck. Similarly, move your shoulders all the way back. Always ensure that you do not bend your arm or rotate at any point. Again you should aim to hold the pulled position for 5-10 seconds. Next, perform the scapula push. You will need to use a wall for this. As previously hold the pulled position and rest your hands against the wall. Thereafter push your shoulders forward. Previously you simply had to move your shoulders forward without any resistance. This exercise simply adds resistance to help strengthen your scapulothoracic muscles. There is a difference in opinion as to whether the next two exercises help relieve impingement symptoms. This is because multiple studies suggest that strengthening exercises work or are beneficial, but some have found that there is no difference in rotator cuff strength between a healthy individual and one with shoulder impingement . We recommend performing the next two exercises because they help warm up your rotator cuff muscles for the final exercise. Lay down on your side on top of your upper arm. Flex the elbow of the arm that is on the ground to 90deg. Thereafter rotate your arm as if reaching the opposite side of your chest without straightening your arm. If you find this exercise too easy, you can add resistance by lifting light weights. Similarly, flex your elbow that is not on the ground to 90 deg. Then rotate your arm outwards as far as you can keeping your upper arm and elbow against your side as much as possible. A multitude of studies have shown that neuromuscular control exercises work the best and provide a huge benefit. They are better than conventional physiotherapy exercises and have shown to reduce pain, increase mobility and restore function. You can read more about the evidence here. Dajah et al. in particular, showed that proprioceptive neuromuscular control exercises can reduce pain and increase range of motion of the shoulder. The aim of our home-based PNF exercise is to try to replicate this PNF exercise. Watch the video below to see the motion that needs to be replicated. You will need to perform the same motion but without the latest MUJO technology. First, you need to get into the start position. To get into the start position, place both of your arms by your sides. Raise your arms to your sides by approximately 45deg. Next, flex your elbows to 90deg. In your current position, you should have your lower arms pointing forwards and your upper arms raised by your sides. Finally, you want to rotate your arms outwards approximately 20deg without moving your upper arm away from or closer to your body. This will be your starting position. The aim is to raise your arms and rotate outwards at the same time in a controlled manner. You can imagine following a curve with your hands. It would be better if you had a curve or a diagonal line on the wall to follow. The position you want to reach is where your arms are raised by your side by 90deg and your lower arms are pointing up. Almost as if you are holding something above your head. You want to return to the start position following the same motion as you did to reach this current position again in a controlled manner. The purpose of this exercise is to correctly engage your shoulder stabilising muscles so that over time your body learns the correct activation of your muscles. You are unable to tell whether you are performing them correctly or not. You are unable to tell if you are consistently performing the exact same motion. Your key muscles may not be activating properly. PNF exercises cannot truly be replicated at home without proper equipment and feedback. Nobody can accurately and objectively track your progress. Kromer et al  showed that exercises only truly work when they are tailored to you as an individual. We have designed our treatment method to be the best. Our clients and users have given plenty of positive feedback. Why not get a free taster session with us to experience the benefit of our methods. You will clearly see the difference between conventional physiotherapy exercises and MUJO’s objective assessments and exercises. Book your free 30-minute session with us at our Aldgate clinic.